Laura Trudeau, Founder and Director of Kresge’s Detroit Program, is set to retire at the end of this month. 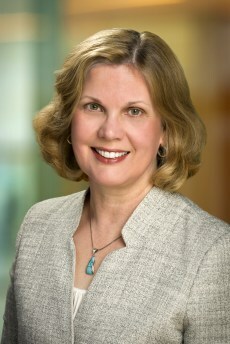 During her 15 years with the Kresge Foundation, Trudeau was instrumental in revitalizing a number of Detroit’s assets—from the riverfront and the M-1 Rail to Eastern Market, Belle Isle, and numerous other public spaces throughout the city and its neighborhoods. Since 2001, Trudeau has overseen the investment of more than $425 million in grants and loans to local nonprofits and to national organizations who could provide resources and leadership to keep Detroit moving forward. Last month, PPS’s Steve Davies sat down with Trudeau to discuss placemaking, philanthropy, and the transformation of Detroit’s public spaces—including Campus Martius and Eastern Market—which are among PPS’s most notable projects. SD: It seems like whenever we were on the planning side in Detroit, you were on the implementation side. It wasn’t always easy. Can you share the story about how you gave a “grant ultimatum” to launch Eastern Market’s renewal after eight long years of planning? LT: Yes! John Marshall, who was our president at that time, was always very deeply interested in the market. He just believed public markets have a transformative effect, especially when you invest in them, as he had seen that happen in other parts of the country. So we made a significant Challenge Grant for the historic restoration of [Eastern Market’s] sheds 2 and 3, provided that the city transferred management of the market to a nonprofit organization as PPS had recommended. The grant was due to expire in June 2006, and on the actual day the grant was supposed to be canceled for noncompliance with this condition, the city council voted to transfer it to the nonprofit. So we always felt that a good share of their motivation was that this was a requirement under our grant. 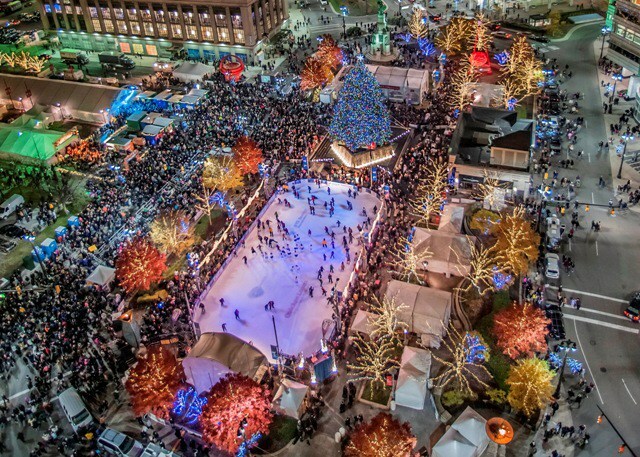 SD: What challenges do you recall overcoming in helping to implement Campus Martius? At that point, I was working at the bank across the street and was part of a community process to consider 4 or 5 different opportunities to recognize the 300th anniversary of Detroit with a legacy project. Campus Martius was selected. It was truly a leap of faith for Detroit and our ideas of what made a great public space changed dramatically. A park in the middle of the street—it was a powerful image, but we couldn’t get our heads wrapped around it! We knew nothing about traffic calming at that point. We were like, how is this going to work? People are going to be getting hit by cars! We had always thought of a space like Hart Plaza, with all of its pavement and the big fountain in the middle. 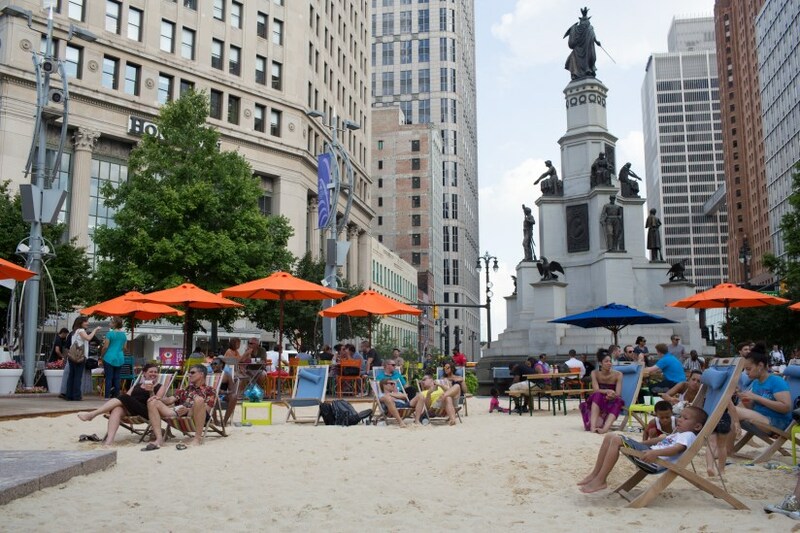 But Campus Martius is smaller, with more of a natural feel, with movable chairs and a lot of flexibility. The design process was a first for us. SD: Can you imagine Detroit without Campus Martius? LT: The thing I love about downtown Detroit now is that I think Campus Martius helped us see the value of the other small parks: Paradise Valley, Capital Park, Grand Circus Park all got a lot of investment after Campus Martius opened. So now we’ve got these neighborhoods that can develop around a public space—and I can’t imagine that would have happened without Campus Martius. I also can’t imagine that we would have achieved the kind of walkability that we now have downtown. I started working downtown in 1972, and it was definitely not a walkable place. SD: The Kresge Foundation is one of the few grantmaking institutions that funds places, not just people. What do you see as the role of philanthropy in promoting placemaking? LT: I think we invest in places because of the impact they have on people’s lives. I think we have had too much of a dichotomy in philanthropy between investing in place or investing in people. You have to do both. You have to invest in people, providing opportunity for their personal growth and development, but you also have to invest in places where that can happen. I think we are still learning to balance these kinds of investments and make sure not to overvalue one and ignore the other, but we have seen huge impacts on our place-based investments. And the quality of place is really a determinant of quality of life in many ways. SD: Kresge is also somewhat unique in the fact that you give capital grants, while many foundations fund only programs. LT: Our founder actually believed that capital grants were a good idea, and Kresge had supported capital projects for fifty years. In Detroit, capital was natural for us because we understood those kinds of investments—how they are complicated and that you don’t get the impact right away. There could be a 4 to 5 year lag time between when you make the decision and when you actually see the impact on the community. I think that is hard for a lot of foundations. But we got used to that lag time and figured out how to measure our impact on a longer term measuring stick. SD: Describe the shift in Kresge’s mission and practice since Rip Rapson became president/CEO. LT: Rip really, truly, has transformed the organization. I was at Kresge for 6 years before Rip arrived in 2006. One of the first things Rip said to me was that we needed to engage with the “critical issues of our time.” What Rip said is, no, it doesn’t always have to be a building project. If a building project makes sense then we’ll do it, but there are other ways we can do research and capacity building, and go a little bit more upstream on root causes. In our Detroit Program, we combined investing in the physical makeup of the city but also funding a lot of research. Our Detroit Future City project combined the two, because we were funding both research about the place and the impact it had on the people. SD: You try to focus on areas where there is opportunity, not just need. Is that fair? LT: Yes, that is very fair. [We focus on] the combination of opportunity and need, and the investment that could help grow the economy as well. The quality of place in our downtown was not appealing to a lot of people who should come there in order to help grow the economy. The initial investments that we and others made basically set the stage for companies to stay and other companies to come in. In Midtown, we involved our universities and cultural institutions as partners and anchors—[we wanted] neighborhood revitalization that would allow Detroit to reassert its global significance. SD: Given the successes and challenges of public space projects in Detroit, what advice would you give other foundations and cities? LT: I would say just stay in the work for the long term because it takes a long time to do the work, and I would say go into it with a very open mind about how the investments need to be structured and be as inclusive of all the partners as you can be. And don’t structure your grantmaking before you know what the needs are going to be. I think if you put too many parameters around it, you can end up not being able to invest in the flexible and the nimble way you need to. So, as I go into retirement, I guess my big takeaway is that every day you learn more than you knew the day before about what kind of investments work and how to connect more to the community. You cannot create it in a vacuum and then implement it. It has to be very iterative process—every day you learn from what you tried previously. SD: Thank you, we appreciate all your support. You have had an amazing impact. LT: It has been a great partnership.